Around £200 billion will need to be spent to develop the next generation of oil and gas reserves in the UK Continental Shelf (UKCS), according to a flagship industry report released today. Oil and Gas UK’s (OGUK) Business Outlook 2019 found that exploration and production companies would need to invest the huge sumin existing operations and new opportunities to meet the sector’s Vision 2035 goal, an initiative which seeks to add a generation of productive life to the UK basin and double the opportunity for the nation’s supply chain. Around �200 billion will need to be spent to develop the next generation of oil and gas reserves in the UK Continental Shelf. The study reported that companies currently plan to continue cost improvements and maintain operating expenditure at its current level of around £7bn to £7.5bn in 2019. Despite record low levels of drilling activity, up to 485 million barrels of oil equivalent have been discovered in exploration wells drilled last year. More new projects were approved in 2018 than the previous three years combined, unlocking some £3.3bn of new capital investment, while up to 15 exploration wells are expected in 2019. The study found one in six contractor companies has “an improved outlook” for 2019, although pressures remain in parts of the supply chain as the industry recovers from “one of its most difficult downturns”. It also stressed a sustained focus on cost and efficiency would be key to the sector’s future, as ongoing uncertainty in commodity markets keeps investors cautious. 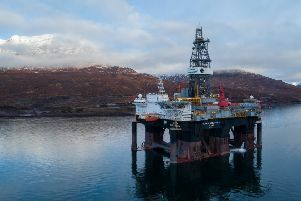 Offshore oil and gas production has increased by 20 per cent in the past five years, providing around 60 per cent of the UK’s oil and gas demand. OGUK chief executive Deirdre Michie said: “Our report finds an industry that’s getting better at what it does, getting smarter in how it does it and is well positioned to deliver attractive returns on investment within this environment, maintaining our global competitiveness. “However, challenges remain across parts of the supply chain, with revenues and margins still under pressure and cash flow stretched. Graham Hollis, senior partner at Deloitte in Aberdeen, said: “The on-going levels of M&A [mergers and acquisitions] activity indicate that the appetite to invest in the basin continues to be positive.